Here we are in the heart of Suffolk, intensely agricultural, the narrow lanes meandering lazily along lost field and settlement patterns. Preston is a pretty village, with the same feeling of remoteness as its neighbours Thorpe Morieux and Kettlebaston. Preston Hall Farm had its fifteen minutes of fame a few years back when an archaeological dig there featured on Channel Four's Time Team programme, but otherwise the modern world doesn't pay a huge amount of attention to backwaters like this. The church is neat and tidy, presenting its tower to the village street, but needing to peep over a splendid tree to do so. The great north porch accentuates the width of the building beyond the aisles, and the crispness is a reminder that most of what you see from the west is, in fact, Victorian. 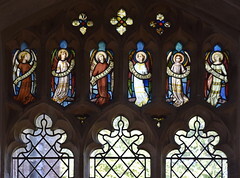 The restorer was Arthur Blomfield. 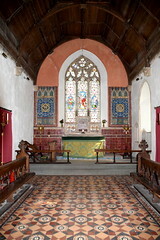 The church had been struck by lightning in 1868, and only the porch and the nave walls survive from before this date. 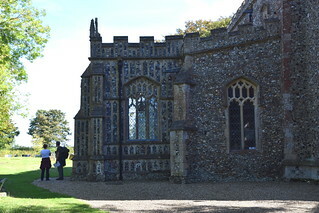 The detailing is similar to that of Blomfield's other rebuilding of the 1860s at Alderton, although he did actually get around to replacing the tower here. In general, no expense seems to have been spared. The porch is the star of the exterior, a confection of late 15th century flushwork. Stepping through it, and the curiously narrow north doorway beyond, you enter a church which, despite its late Victorian timbre, has a great deal of interest. 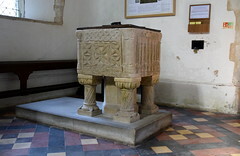 The first sight is of the font, which, although typically square Norman, has pretty little designs, as though its maker was already infected with ideas of Decoration to come. 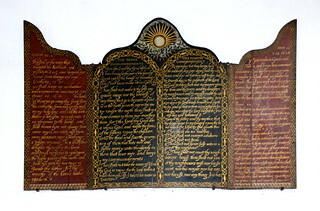 It is tucked into the west end of the north aisle, and above it is the famous Preston decalogue board. This is difficult to date exactly. 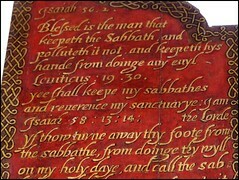 Obviously, it is post-Reformation, and bears the Commandments with other Biblical texts about keeping the Commandments and observing the Sabbath. Textual analysis suggests that it may date from the reign of Edward VI, which would make it the earliest of its kind in England. 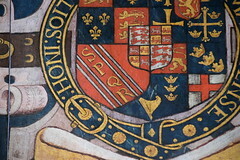 Of course, it may be later, and further east along the north aisle is a matching royal arms for Elizabeth I. There are three of these in Norfolk, but this is the only one in Suffolk. Cautley counted thirteen altogether in England. It may not have been here originally, for the rector here in the later years of the 16th Century was the antiquarian Robert Ryece, who we know was a collector. 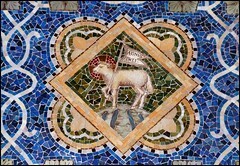 However, it seems likely that he commissioned it himself, for it is a most curious thing, the arms including a unique mixture of genealogical symbolism, some of it mythical, including the SPQR of Ancient Rome. 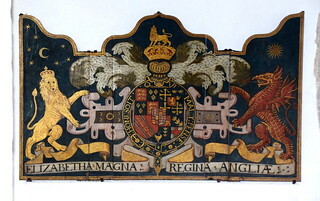 The legend along the bottom reads Elizabetha Magna, Regina Angliae>, 'Elizabeth the Great, Queen of the English'. Curiously, it appears that the arms are painted over an earlier set, and the letters ER are plainly visible. This might just mean that there is a simpler Elizabethan arms beneath. More excitingly, it might be that the whole structure dates from the 1540s, and the reign of Edward VI. 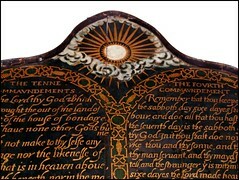 This would make them the earliest decalogue board and arms in England. Further, the outer doors bear warnings against idolatry, suggesting an Edwardian origin. 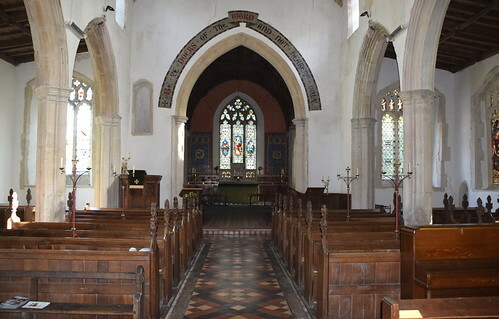 Blomfield restored St Mary to be in the highest rank of Tractarianism, and the grand chancel is a little out of place in this intensely rural setting, matching his masterpieces at the churches of St John the Baptist in Ipswich and Felixstowe. 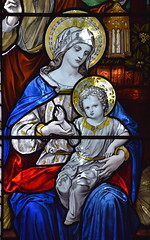 The 1880s glass of the Adoration of the shepherds and magi in the south side of the nave by Ward & Hughes is striking, the workshop full of confidence before its long decline over the subsequent decades. Memories of the earlier church survive. 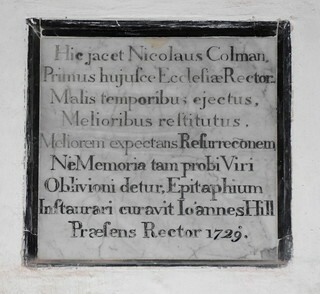 In the early 18th Century, rector John Hill installed a memorial plaque to his predecessor Nicholas Colman. 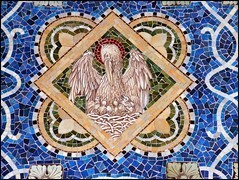 This now sits on the south side of the chancel. It tells us in Latin that Colman was malis temporibus ejectus, melioribus restitutus, 'in evil times driven out, in sweeter times restored'. Colman was a scandalous minister, which is to say a theological liberal in the Laudian tradition, who rejected the puritan uprising and spoke in favour of the Crown during the turmoil of the years before the establishment of the mid-17th Century Commonwealth and the suppression of the Anglican church. 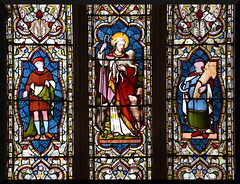 He spoke out against the Solemn League and Covenant, which would have bound the English and Scottish churches under a Presbyterian system of government without Bishops and Dioceses. He not only refused to sign the Covenant, he advised his parishioners not to sign it either, warning them that there would be blood on their hands. Colman was ejected from his living by the usual practice of getting some of his more puritan-minded parishioners to make accusations of gross immorality against him in front of a committee set up for this purpose. The Committees Against Scandalous Ministers had been introduced in early 1644 in the Eastern Region by the Earl of Manchester. 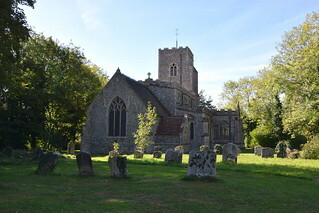 They were successors to the committees set up by the Long Parliament the previous year to remove ministers with royalist sympathies in areas where the Royalist Army was operating, but since this could clearly not be applied to Suffolk, a minister's liturgical practices and moral behaviour became the key to getting rid of him. The accounts of the committees' proceedings survive, and make for reading which is at once hilarious and terrifying. As well as the usual Laudian practices and Royalist sympathies, Colman was also accused of being a frequent company-keeper and very much given to drinkage, and sometymes hath been so overcome with beere that he hath been necessarily guided home. It was alleged that Colman had once neglected his duties for six weeks after breaking a leg whilst drunk, despite the fact that the bonesetter had sett his legg in such a manner that he might goe on it agayne the next morninge. 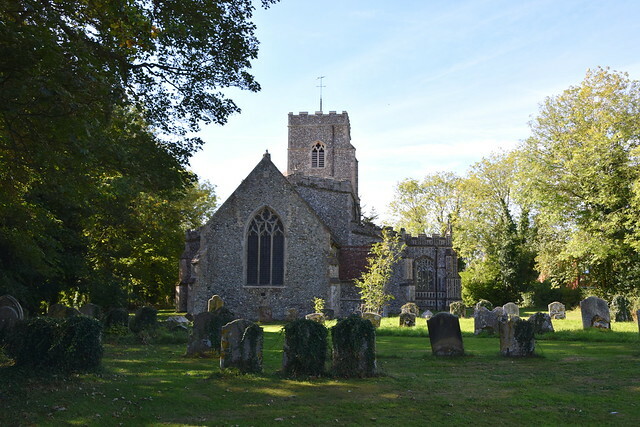 In fact, these were mild accusations compared with those made against some other Suffolk ministers, who, local gossips swore to the committee, were not only excessive drinkers but regularly engaged in fighting and consorting with prostitutes. It isn't hard to imagine what Twitter would have been like if it had been around in the 17th Century. Colman had the last laugh, but many other sequestered ministers fell on hard times and died in poverty before the Restoration of 1660. Up above the nave there are shields oddly reset in the clerestory. 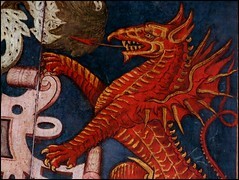 Mostly heraldic, some are pre-Reformation, and were collected by Robert Ryece from all over England. This, only part of his collection, glorifies this little country church. But, obviously enough, it diminishes those elsewhere that lost them.